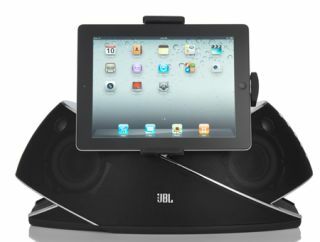 UPDATE: JBL OnBeat Xtreme offers wireless audio, iPad docking and speakerphone | What Hi-Fi? JBL's OnBeat Xtreme wireless iPod/iPad system is now on sale in the UK, priced £400 - significantly less than the expected price at its IFA launch (see below). We hope to review the system very shortly. JBL has expanded its OnBeat range of docking systems to include Apple AirPlay and Bluetooth wireless models, plus two new iPad-friendly designs. But docking isn't your only option with the OnBeat Xtreme, which also supports Bluetooth wireless audio - therefore allowing the big box to play tunes from any Bluetooth-equipped device, including computers plus non-Apple portables. The OnBeat Xtreme also has an integrated speakerphone, making it a sonic boost for Skype or Apple Facetime video calls. “The JBL OnBeat Xtreme is a game-changing iPad accessory,” claims Sachin Lawande, EVP and Co-President of Harman's Lifestyle and Infotainment Divisions. The OnBeat Xtreme also features a line input - to hook up other devices - plus a USB socket to enable both iTunes synchronisation and firmware updates. It will be avallable from next month, priced around £500. We heard an early sample of the OnBeat Xtreme here at IFA and first impressions are that this has real room-filling potential; the wireless appears to work well, too. We'll follow up with a full review when production units ship next month. Also new in JBL's range is the OnBeat Air (right), an Apple AirPlay enabled version of its existing OnBeat docking system: a smaller sibling to the Xtreme. Available – like the original – in black or white finishes, the OnBeat Air will ship next month, and is expected to cost around £200. Like its big brother Xtreme, the OnBeat Air can hold an iPad, iPhone or iPod, in either landscape or portrait format. It uses Apple AirPlay's wireless streaming system if you don't want to dock your iThing. Already in shops from JBL's AirPlay line-up is the On Air Wireless (left), which offers a wider range of features - such as clock/alarm functionality and a colour display. As you can tell from the picture, its dock is more iPhone/iPod than iPad, though of course adding AirPlay means you can stream wirelessly from your Apple tablet. The JBL On Air Wireless is in shops now, priced around £260.